At Waterfront Terraces, we have a selection of eight two-bedroom apartments, suitable for up to 5 people. 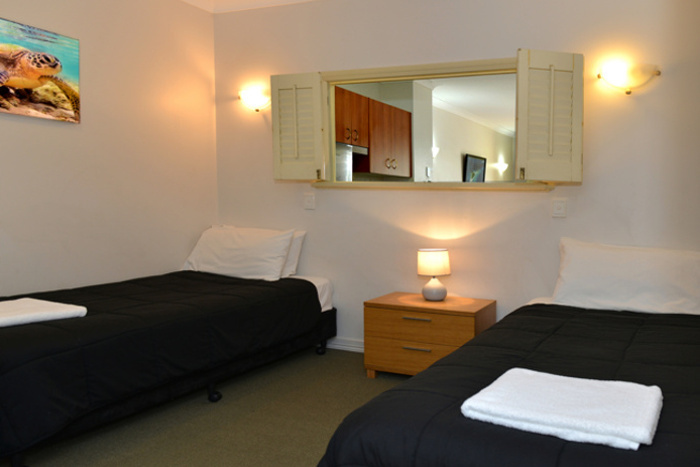 Our fourteen one-bedroom apartments are perfect for up to 3 people. The apartments feature a comfortable sofa bed in the lounge. All apartments are spacious and we provide free high-speed unlimited Wi-Fi, large flat screen TV, ceiling fans and air-conditioning for that perfect night’s sleep. Waterfront Terraces apartments are pleasantly furnished with sea-facing balconies or tropical garden courtyards. For your convenience, you will appreciate the granite kitchen featuring separate hot plates, an oven, microwave, full sized fridge/freezer, dishwasher as well as crockery, cutlery and cooking utensils. Apartments also have the added convenience of individual laundries with automatic washers and tumble dryers. Linen is provided and all apartments are serviced weekly (change of linen and towels). An optional daily or more detailed servicing can be arranged. Sleeps 3 adults - queen-size bedroom and sofa bed in the lounge, either full-sized balcony on the first level or our ground level tropical courtyards. Sleeps 5 adults - queen-size bedroom, second bedroom twin beds and sofa bed in the lounge. These apartments feature a full-sized balcony on the second level. Please note; we do not have lifts. Waterfront Terraces is a boutique Cairns Esplanade Holiday Apartments centre that provide both 1 and 2 bedroom apartments for short or long term stays. 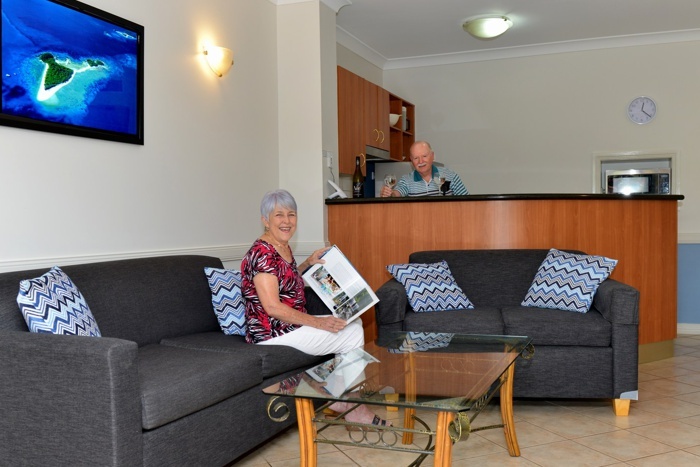 Waterfront Terraces provides convenient Accommodation near Cairns Base Hospital which is ideal for out of town visitors who are supporting family and friends for hospital stays. 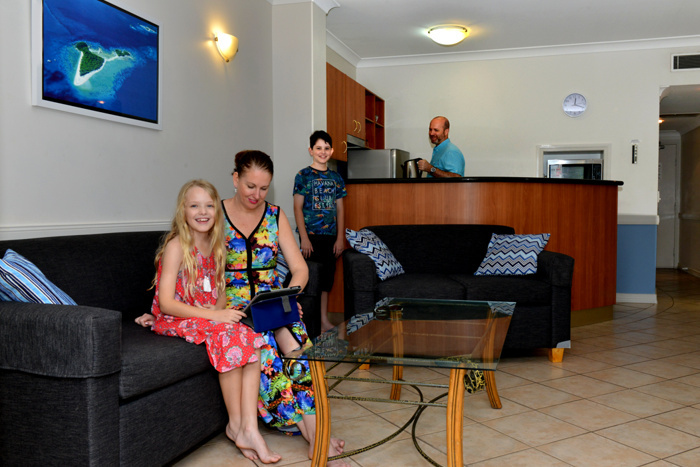 Our apartments are completely Self Contained Accommodation Cairns with kitchens and separate bedrooms as well as private bathrooms. 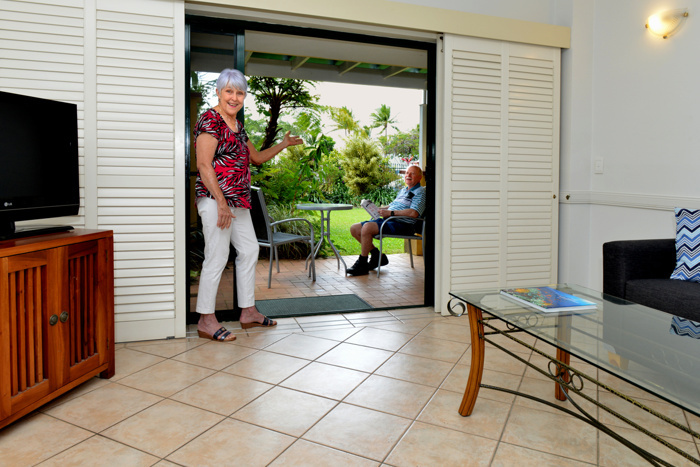 Visitors who stay with us at our Cairns Waterfront Affordable Accommodation get some of the best views of the Cairns Esplanade with private balconies ideal for taking in the views out to Green Island and the Great Barrier Reef. 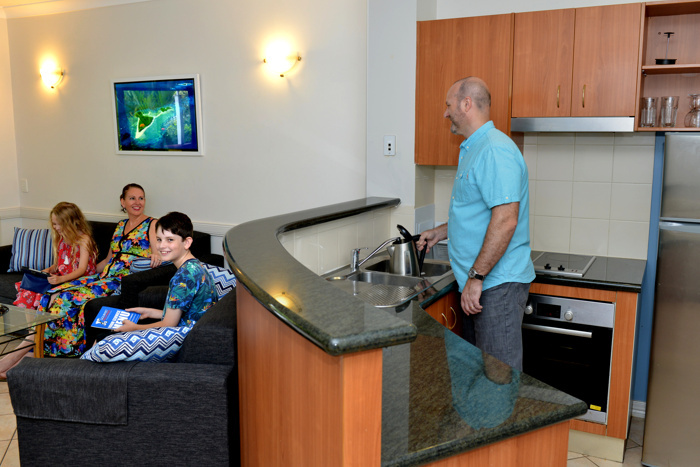 Because we are positioned on the Esplanade we provide guests with great Cairns Oceanview Accommodation with great views from almost every room in the apartments.